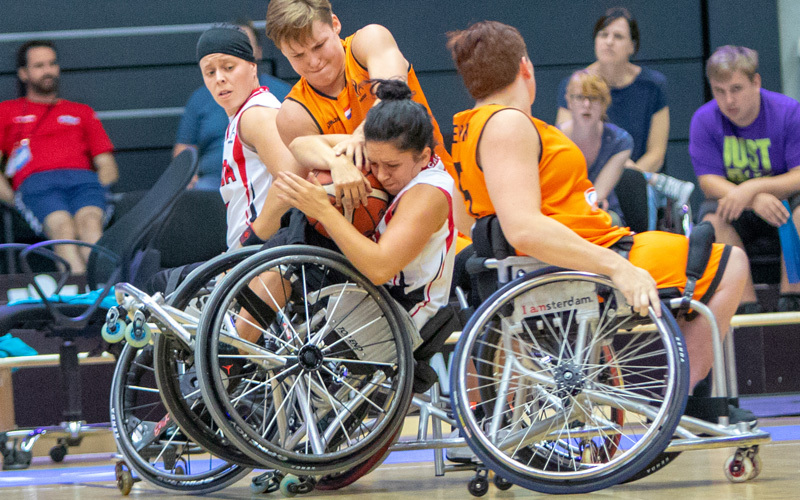 (Hamburg, Germany) The Canadian Women’s Wheelchair Basketball Team dropped a 64-52 decision to the Netherlands in pool play at the 2018 World Championships in Hamburg on Tuesday. Canada sits third in pool A with a 2-2 record. After a strong start by Canada, the undefeated Netherlands side found its groove and put on a clinic in the paint as Canada struggled to contain the formidable offensive duo of Mariska Beijer (36 points) and Bo Kramer (22 points). Arinn Young (Legal, Alta.) was the top point producer for Canada with 21 points, closely followed by Cindy Ouellet (Quebec. Que.) with 18 points. The Canadian women play their final round robin game on Wednesday at 4 a.m. ET against Brazil (0-4). 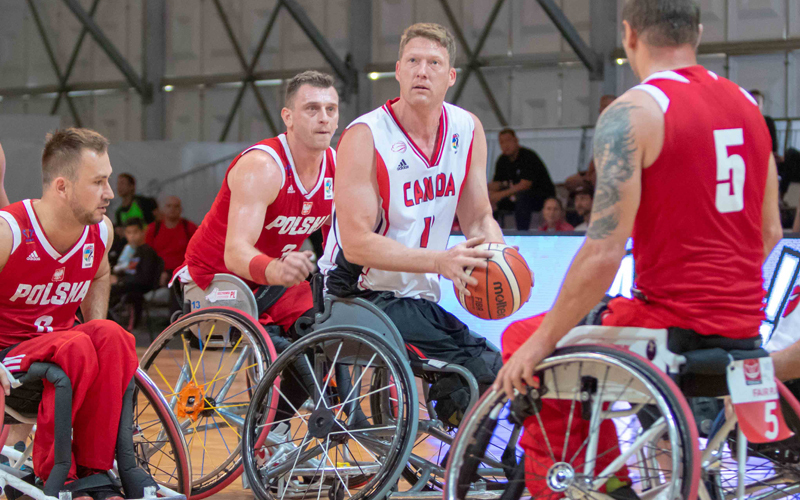 In earlier action, the Canadian Men’s Wheelchair Basketball Team lost a 79-68 heartbreaker to Poland in crossover play to fall out of medal contention at the 2018 World Championships. Poland advanced to the quarter-finals, while Canada will resume play in a placement game. Poland aggressively attacked the basket with speed, precision shooting from the outside and a commanding presence in the key, shooting 61 per cent from the field. Despite a solid effort by the Canucks on both sides of the ball, they simply had no answer to slow the Polish offence enough to close the gap on the scoreboard. “I’m very disappointed. They are good team and they shot very, very well and exploited their height advantage over us,” said Canada’s Patrick Anderson (Fergus, Ont.) “We put enough points on the board to win, but defensively we couldn’t get the stops and that’s sort of been our story here. We are going to have to continue to work on our offence but get a lot better on defence. Canada came out flying in the open frame, starting off on a 9-2 run that included one of three three-pointers by Young. The skillful Netherlands team quickly returned the favour though, going on a 15-2 run to go up 17-11. The Dutch made sure to double and sometimes triple-team Young in the opening quarter to try to slow the Canadian offence. By the half, Netherlands players Beijer and Kramer combined to score 31 of 34 points for the Dutch as they extended their lead to 10. Young finished the half with 12 points, including two three-pointers. Young and Ouellet got hot at the start of the third quarter, bringing Canada to within just six points and forcing Netherlands to call a time out. Soon after, Ouellet committed her fourth foul of the game and was subbed out by Ducharme. With pressure building, Young committed an intentional foul that allowed Netherlands to keep the possession and extend their lead. They finished the quarter up 47-39. In the final frame, Erica Gavel (Prince Albert, Sask.) came into play, scoring four points off the bench. But another intentional foul by Canada allowed the Dutch to stay in front. With just over seven minutes left in the game with Canada down just eight, Ducharme put his starters back in the game to try for a comeback. Even with another three-pointer from Young and a nice breakaway shot from Ouellet, the Canadians weren’t able to stop the dominant Netherlands offence. In the 64-52 loss, Young tallied another 20-plus point performance finishing with 21 points, six rebounds and six assists. Ouellet scored 18 points and secured seven rebounds. Fifty of the Netherlands 64 points were scored inside the key, with 58 of their points scored by Beijer and Kramer. Early in the game, it was clear that the height and speed of the Polish team made for a tough match-up for the Canadians. Poland converted on multiple stretch passes and fast break points to take a lead 21-15 by the end of the first quarter. In the second, David Eng (Montréal, Que.) and Patrick Anderson (Fergus, Ont.) led Canada’s offensive charge with captain Bo Hedges (Wonowon, B.C.) quarterbacking at the head of the offense. While they had multiple good looks to the basket after some great passing, they were unable to convert on multiple opportunities inside. Canada caught a break near the end of the half as Anderson completed a three-point and-one play to tie the game at 31-31. But, Poland closed the half on a 6-0 scoring run to regain the lead, 37-31. At the half, Poland was shooting 56 per cent from the field to Canada’s 40 per cent. The Canadians got a surge of energy in the second half with Nik Goncin (Regina, Sask.) coming off the bench to score seven straight buckets for Canada, part of his game-high 25 points. But, Poland countered the Canadian rush, increasing their lead to 13 as their field goal percentage continued to rise. Poland was up 11 at the end of the quarter. After both teams took turns trading baskets in the final frame, Anderson hit a clutch three-pointer to bring the game within just six points near the three-minute mark. Poland responded by continuing to aggressively attack the basket though, and following a couple easy baskets in the key, they sealed the win 79-68. Poland finished the game with precision shooting from the outside and a commanding presence in the key, shooting 61 per cent from the field. Anderson notched another double-double on 19 points, 11 rebounds, and 8 assists.